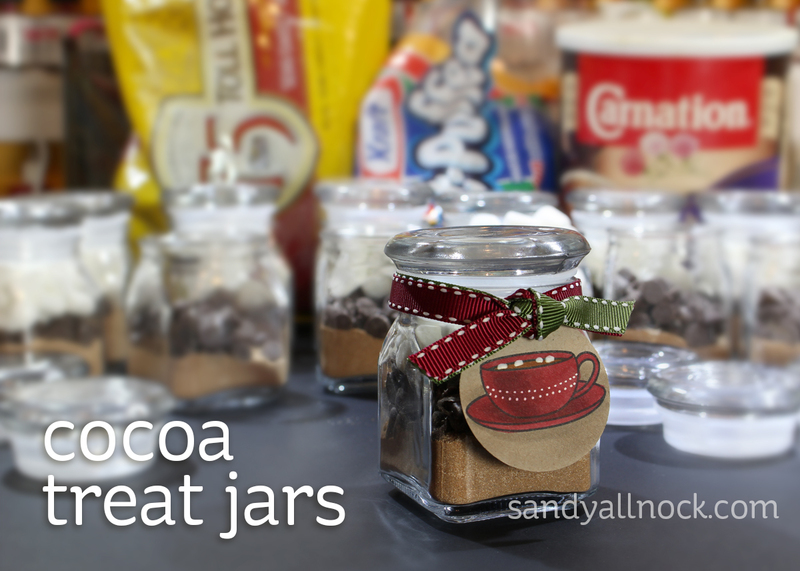 Just wanted to pop in to wish you a happy boxing day and bring you a quick idea for cocoa treat jars in case you forgot a few unappreciated people this year. It’s still “legal” to pass on the Christmas cheer for another week! And who might those folks be? Maybe the mail carrier, the sanitation workers, recycle pickup folks, your hairdresser, or bank teller! This is a great time to let people know you appreciate them….and it’s easy to tuck a box of these treat jars in the car, and slip one in your purse to hand out each time you run an errand this week! I got some really inexpensive little jars and filled them with a couple spoons of cocoa mix, hershey kisses, and mini marshmallows. (Note: it IS legal to count “One for them, one for me” as long as you have big enough bags to make them all!) I wrapped each one with ribbon and added a little tag with a quickly-colored mug stamp – so simple and cute! two BIG marshmallows and glue googlie eyes on the outside to make them snowmen! Make a matching tag, and if instructions are needed to use the contents, include that. 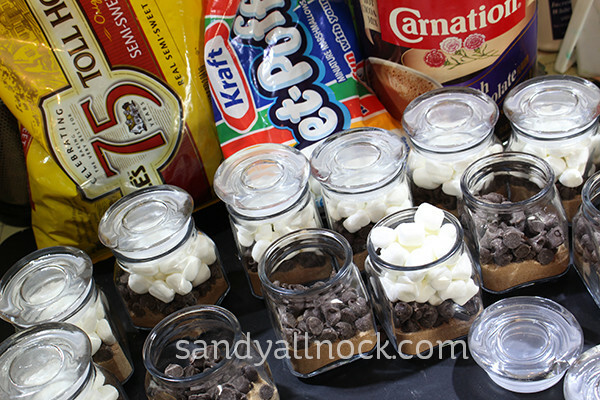 Bigger jars can contain all kinds of things…let your imagination run wild! Maybe you could give one to your preacher, local shop owners that you do a lot of business with, maybe even take a bunch to a nursing home. homemade Mexican taco or fajita spices for the Mexican food loving person in your life. Or you could fill it with steak rubs or other kinds of spices. Little gifties like these are so much fun to put together and then to give! Lots of joy going on here!! When small we went caroling every Christmas to church members homes. They always invited us in for either hot chocolate or cake or cookies of (YUM) homemade fudge. One idea of giving your treats would be to give one to each member of your church choir just to say thanks for all the extra time they spend to give a gift of music. Your idea is awesome!! And I loved the counting of the mini marshmallows. Lol!! I think our doctors and nurses would be someone to give this sweet gift to! very cute! i’d add police officers, pharmacists, veterinarians and lab technicians. How about the staff at your local library? They always appreciate the extra thought at Christmas time. I really like this idea. Thanks! Cute idea. Your server when you go out to eat. I have left a little candy treat with their tip. This Christmas, I put a few of those red and white mints in a small bag and added a tag that said Candy Cane Seeds on the front and Merry Christmas on the back. I made a popcorn/chex/pecan caramel mix and gave to my neighbors this year. My nephew gave an interesting “activity” gift at his huge family gathering. The grandmother received 2 bottles of vodka, everyone else received an 8 oz empty jar and a vanilla bean. They all sliced open the bean, put the liquid and bean in their jar, filled the jar with vodka. In 8 weeks they will have vanilla extract! I guess you need to shake the jar once/week while it is fermenting. I think this is cool. Hands down the dentist! I don’t know about you but I am a wimp when it comes to going to the dentist. I really, really dislike the experience. I don’t dislike the dentist. Just everything he does. So he/she definitely deserves a little treat! These are adorable. I can think of a few….Hospital staff who are there over Christmas & New Years (while everyone else is enjoying their loved ones! ), Same with nursing home workers, senoirs without family, power workers who are out in bad weather day and night (whenever need), same with highway workers (my husband being one of them!) who do their ‘darndest’ to keep people moving in the worst of weather! Thanks Sandy for all that you share throughout the year. Happy New Year! You’ve hit a home run with this topic! I am making small ‘Thank You’ gifts all year long for Christmas giving. If someone in your family has been ill, that’s a no-brainer…those awesome chemo nurses at the hospital! The nice people at the bank; the post office where they put mail in your box even without the correct address. People who did something really nice for you even if they didn’t need to. The lady who judged the ‘Ugly Sweater Contest’ at the office….oh my, the list can be miles long. Happy New Year to all! Thanks, Sandy, for all you share. You have inspired me to ramp it up! What a cute treat to place in the mailbox for the mailman! You could use unbreakable jars/containers and fill them with first aid materials for a car; or a small survival kit (fishing hook, string, staydry matches and small jack knife). Another idea is to make a jar filled with a packet of instant soup and hang a pkt. of oyster crackers from the lid like a tag. Thanks Sandy, These kind of treats don’t take much time to put together and are always appreciated by people. So cute. Great idea. I could give to people at church who do behind the scenes stuff. Dentist, doctor, nurse, fire fighters, ambulance drivers…. Love it! Where did you get the jars?